Your homes dryer ducts ventilate hot moist air from the clothes dryer, to the outside. Most of the time they operate without any problems. However, even a small dryer vent problem can have significant consequences. 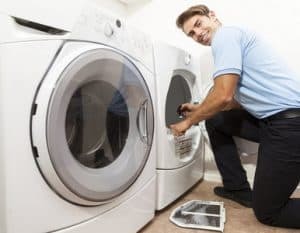 Lint buildup in your dryer vents forces clothes dryers to work harder. Over time this neglect cause clogs, leaks, mold, structural damage and of course the possibility of fire. 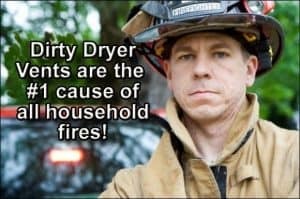 According to the National Fire Protection Agency, Fires caused by dryers are responsible for approximately 15,000 house fires, 15 deaths, and over 200 million in property damage each year. Most of these incidents are the result of lint buildup and ventilation code violations. Fortunately, this is very easy to prevent with a little maintenance. Quality dryer vent cleaning will save money and give you total peace of mind. A1 Sparkles offers professional dryer vent cleaning services to local customers in Philadelphia, Montgomery County, Bucks County, Berks County, Chester County, Delaware County, Delaware, and South Jersey area. As Philadelphia’s best dryer vent cleaners our goal is to significantly improve the efficiency and safety of your entire dryer ducting system. If you’re searching for the best dryer vent cleaning, inspecting, and repair service near you, you’ve found them! Up to 500% dryer efficiency increase. 10 -30% discount on future cleanings. 50-Point safety and code inspection included. As our way of saying thanks will give you the best carpet spotter on earth! We also carry a full line of heavy-duty made in the USA high-tech ventilation materials, lint alarms and exterior covers. Book Your Dryer Vent Cleaning Online and Save $10! Most dryer vents are cleaned using compressed air tools and jet-snakes that blast loose lint and debris. HEPA filtered vacuums or backpack vac’s catch lint and debris. Brushes and air whips may be used for vent clogs. Under normal conditions, dust shouldn’t escape. Repairs, re-routing, infrared inspection, lint alarms, declogging, prolonged ladder work, and replacement materials are extra. No roof work. With your permission, we can repair most code violations. This way you know your dryer vent is clean and safe. Total run length is too long. Ventilation shaft has too many turns. Bats, mice, and sensible live animal removal. Replacing old vent covers with steel cages. Exposed screws in the ventilation system. Plastic or PVC duct materials. Crushed hose behind the dryer. If you want the best dryer vent cleaning, please give us a call 610-292-9069 or complete our online request form.